1. In or according to styles or types no longer current; not modern. 2. Favouring traditional or conservative ideas or customs. 1. A cocktail consisting chiefly of whisky, bitters, water, and sugar. The origins of the cocktail has been greatly contested and little has been documented, but what we do know is that back in the eighteen hundreds a letter was written to a New York newspaper asking what a cocktail is. The newspaper responds with these four elements… A mixture of spirit – any spirit – plus water, sugar and bitters. 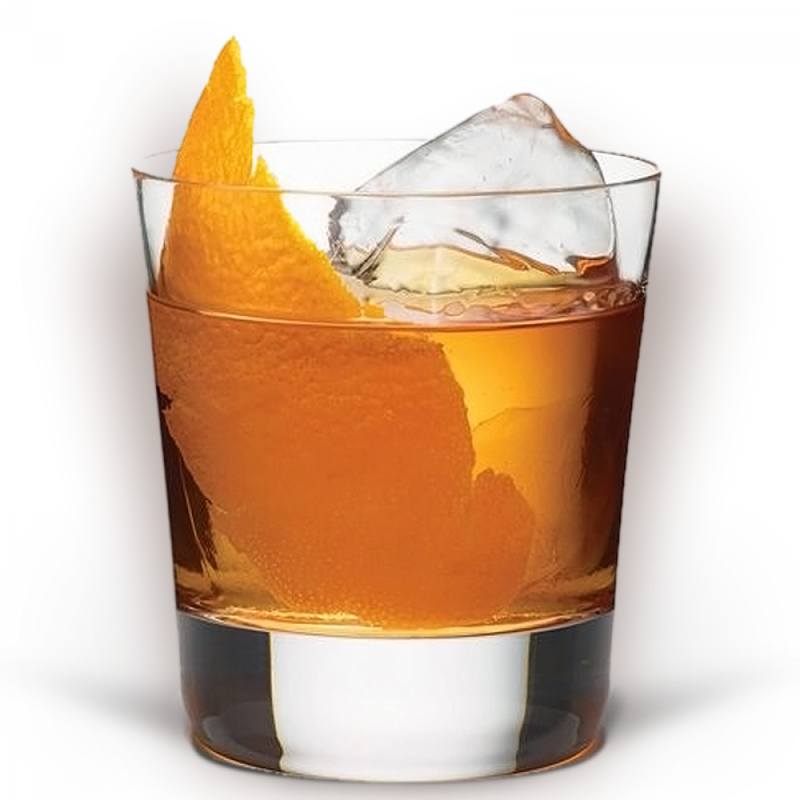 Therefore, ‘The Old Fashioned’ is the original old fashioned cocktail. No one really knows if the first old fashioned cocktails contained rye or bourbon, but it seems that most bars prefer to reach for the bourbon sooner than the rye. However, there seems to have been a surge in Old Fashioned variations in bars all over the world. I guess you could call it ‘a modern old fashioned’. One reason that could be said for this recent interest in modernisation is the bitters market. This has exploded over the last decade, with more flavour profiles than ever before, and with a more health-conscious public, your local grocery shop is likely to carry a selection of sugars to play with (agave, coconut sugar, turbinado, Jaggery etc). So with this in mind, FNND will give you four Old Fashioned variations along with our lazy old fashioned – for those times when you don’t want to stir ice and whisky for ten minutes. This is the classic. Take a sugar cube and dampen it with a couple dashes of Angostura bitters, then crush it with the flat end of a bar spoon. 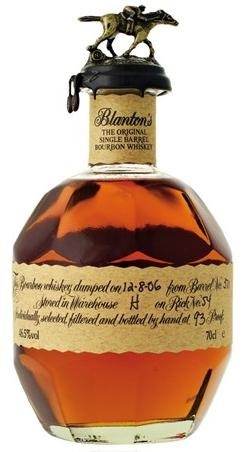 Toss in a couple big, solid ice cubes and top with three fingers of Rye or Bourbon (FNND’s favourite is Blanton’s Bourbon). Stir in the glass for a good couple of minutes. Cut a decent piece of of orange peel, twist, and gently stir into the drink. Instead of the angostura soaked sugar cube,throw in one bar spoon of syrup de gomme, three fingers of Bourbon a few dashes of Angostura bitters, 1 dash of orange bitters, a couple of big ice cubes. Gently stir in orange peel and a dash of water and serve. If you think that only Whisky can hold up in an old fashioned – think again. Zacapa Rum gets better and better as the ice melts. A delicious version. Combine rum, syrup, and bitters in a boston shaker glass with large ice. Stir vigorously and strain into a rocks glass over 2 large ice cubes and garnish with twisted orange peel. Take a maple syrup and a couple dashes of maple bitters. Toss in a couple big, solid ice cubes and top with 60ml or three fingers of Rye. Stir in the glass for a good few minutes. Cut a decent piece of of orange peel, twist, and gently stir into the drink. 2 good dashes of Angostura bitters. Combine your the Bourbon or Rye with the syrup de gomme, bitters with two big ice cubes and gently stir in a twist of orange peel. 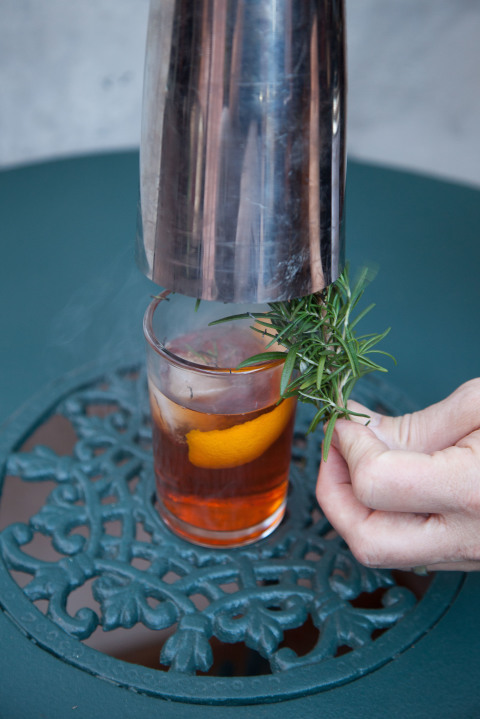 light your sprig of rosemary whilst holding over the surface of the drink and cover with the metal end of a boston shaker. The smoke will infuse over the drink. Remove the shaker and serve. It is important to master making the classic version first. After-all, it is hard to improve on a classic but it’s also fun to play, so Swap the rye for scotch, brandy/cognac or even gin or tequila, most base spirits will do nicely (although FNND hates a tequila old fashioned). You could try literally almost any other type or combination of bitters. Swap the sugar cube for maple syrup, agave nectar, or any other natural sweetener. The possibilities are endless. But remember to drink responssghjhhy.